"This issue will come up during President Obama's visit," says Netanyahu. 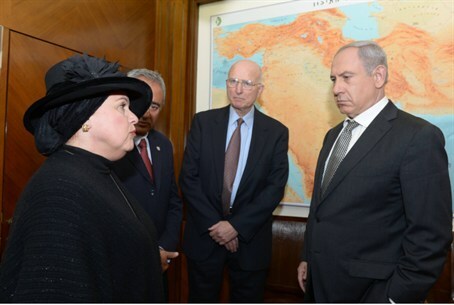 Prime Minister Binyamin Netanyahu, met Monday with Esther Pollard, wife of Jonathan Pollard. Former US Assistant Secretary of Defense Lawrence Korb and Effie Lahav, head of the Committee to Free Jonathan Pollard, also attended the meeting. At the start of the meeting, Prime Minister Netanyahu said, "The time has long since come for Jonathan to go free. This issue will come up during President Obama's visit. It has already been raised countless times by myself and others, and the time has come for him to go free." Esther Pollard said, "Jonathan can't go on anymore. This is a golden opportunity now that the President of the United States is coming. If not now, when?"